from California and Upton Sinclair's running mate in the 1934 gubernatorial campaign. U.S. Office of War Information photo, National Archives. 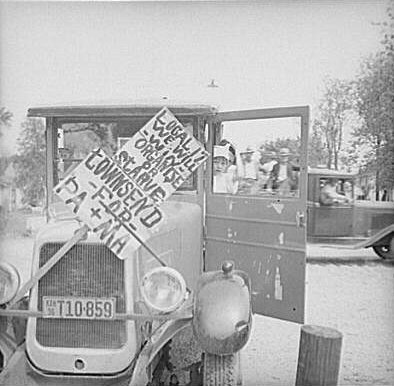 Townsend supporters rally in Columbus, Kansas in May 1936. Dr. Townsend published his plan in a Long Beach, California newspaper, as a kind of extended "Letter to the Editor," in early 1933. He was surprised by the swift and massive response the letter generated. Townsend had tapped a major social problem in America (poverty among the elderly) and the nation was crying out for a solution. Townsend's letter led to the formation of an organization and the development of a formal Plan. The Plan was then published as a pamphlet and distributed throughout America. This is the pamphlet the Townsend group distributed in early 1934. At this early point in the campaign they saw President Roosevelt as an ally. (You will notice that page 19 of the Plan quotes President Roosevelt at length.) Townsend fully expected Roosevelt to endorse his plan. Roosevelt, like most establishment figures of the era, saw the Townsend Plan as irresponsible and unworkable. Indeed, there is some evidence that Roosevelt was prodded to introduce his Social Security proposal to counter the growing influence of the Townsend Plan. 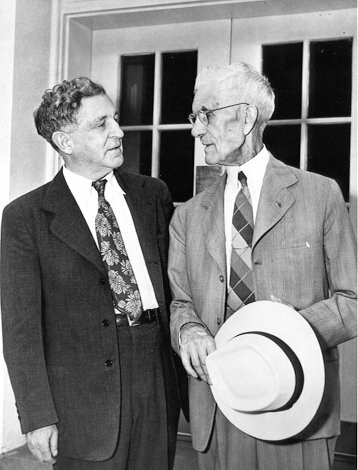 Townsend and his followers were bitterly disappointed with Social Security because it did not promise immediate payments in 1935, because the benefits Social Security promised were small compared to the $200 per month that Townsend wanted, and because people had to work under the Social Security program to earn a payment. "The Modern Crusader" was the newsletter published by the Townsend Plan's Long Beach, California headquarters. It began publication in the summer of 1934 and this is the October 26, 1934 issue. At this point in the "crusade" enthusiasm is running high and many California politicians and merchants were anxious to be identified with the movement. Page 1 of the "Crusader" promises the "Largest Mass Meeting in World's History," and to "do Away with Poorhouses." The lead editorial promises nothing less than to ". . . make the United States the ideal spot on earth in which to live." These are cartoons related to the Townsend Plan and Social Security--three are from the Townsend newsletter and one is an item from the mid-term 1934 elections. This cartoon stamp was part of a series produced by the Republican party for the 1932 presidential election. The series was designed to attack the Democratic candidate, Franklin Roosevelt, and other stamps in the series depicted FDR as a Frankenstein monster run amok, as using the Constitution to light his cigarettes, and the like. This stamp was intended to imply that FDR would drain the pockets of America's workers to fill the pot of America's elderly, by pushing through the Townsend Plan if elected President. 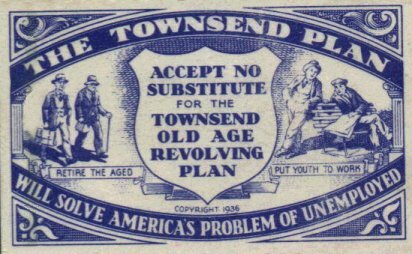 This particular stamp is doubly ironic, since FDR was a vehement opponent of the Townsend Plan, and many Republicans advocated Townsend-type flat-benefit schemes as alternatives to Social Security in the years following the 1932 election. 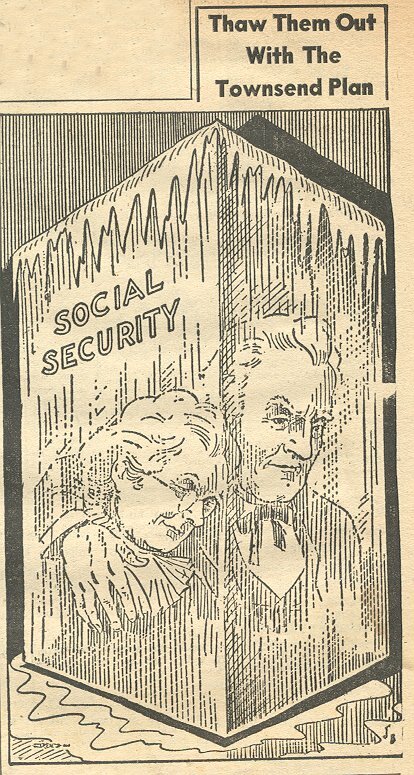 This cartoon, from the Townsend Plan's Weekly newspaper, expresses the group's continuing dissatisfaction with the Social Security program. In their view, the Social Security Act was an obstacle to passage of their own Plan. This cartoon, from the Townsend Plan's "Weekly" newspaper, is still arguing that the Townsend Plan is superior to Social Security. This argument would still have appeal until the passage of the 1950 Social Security Amendments dramatically increased the value of Social Security benefits. 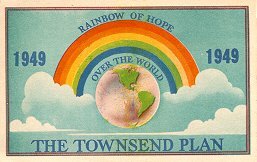 Among its multitudinous public information materials, the Townsend organization produced license plates, windows stickers, commemorative plates and spoons, and numerous decorative stamps which Plan supporters used to adorn their letters. Here is a sample of a few of the stamps used to promote the program. The Townsend Plan put out an amazing array of promotional materials. This calendar from 1940 is one of the finer examples. This letter from Dr. Townsend to President Eisenhower is indicative of the persistent interest Townsend and his followers showed in issues related to Social Security-- even well past the point that most obsevers would say the issue was moot. Indeed, the Townsend organization, in one form or another, would continue in existence at least until the early 1980s. The letter also reveals something of the passion Francis Townsend brought to his crusade.